Everyone knows that if you want to be a savvy modern marketer, you need data. Agencies tout their expertise in data-driven marketing, big brands herald a new age driven by big data trends, and it’s standard practice to have Google Analytics set up on your website. You might have Google Analytics on your site, but how often do you check it? You might know the last email you sent had a 40 percent open rate, but what does that mean for your business? The ability to collect and analyze huge amounts of data has undoubtedly transformed our society. But many marketers simply don’t have huge amounts of data. The average marketer’s data are small, imperfect, and unpredictable. In our world, the algorithms, statistics, and trends that drive big data discovery just don’t apply. To get the most out of our small, imperfect data, we need a different kind of tool. At my last agency job, one of my responsibilities was to create a monthly report for each client. At first, I simply created the report and sent it off to the client. But over time, I realized the report wasn’t doing anything. Yes, it demonstrated to the client that we were delivering on our services. But we claimed to be a data-driven agency. How were we using that data to improve our services? So, I decided to work with our content creators and explain the data to them — show them the trends I saw and hope that would influence how well we did our jobs. First, I sat down with our social media manager. Each month, the social media manager was responsible for developing the content calendar for each of our clients. As she was doing this, she had some ideas about which posts might resonate with our audience, and which ones might not. When I began reviewing the performance of each post with her at the end of each month, I started to notice something interesting. Sometimes her ideas would be validated: “I knew that one would go well!” she’d exclaim. The important part, though, was that after starting this ritual, our social media engagement began to climb. Every month, the manager would leave our meeting with new ideas and inspiration for the coming month — and most importantly, a slightly improved intuition. For a while, I assumed this kind of improvement happened naturally when you exposed a content creator to performance data. Content + data = success. Right? Well, not necessarily. Since then, I’ve recognized that there were two reasons why reviewing data worked for our social media manager. We had a clear goal and KPI for each post. We wanted to boost social media engagement; if one post got more likes than another, it was clearly working. The social media manager had expectations for each post. Before she published, she had her own ideas about what might work and what might fall flat, and those expectations were based on the clear goal of more engagement. Then, later, our data would confirm or rebut her expectations. In other words, for every post, our social media manager had a hypothesis. Working as a data analyst, I’ve come to realize there’s a huge difference between working with marketing data and being a scientist. Scientific experiments are held to a rigorous standard — you have to collect data for a particular purpose, then analyze your data like you said you would. And if you don’t find what you hoped to find, you’re not allowed to re-analyze that same dataset. As marketers, we only have one dataset, and we only have limited control over how it’s collected. So we analyze again and again, hoping to find an insight we can use. But anyone who works with data — scientist or marketer — knows you can make data say just about anything. And that’s where marketers should take a cue from our academic cousins. If you continually create content — whether it’s social media posts, email newsletters, articles, videos, or ebooks — you have opportunities to conduct your own micro-experiments. Most people see opportunities, but believe they can just publish and “see what works.” Don’t fall into that trap. 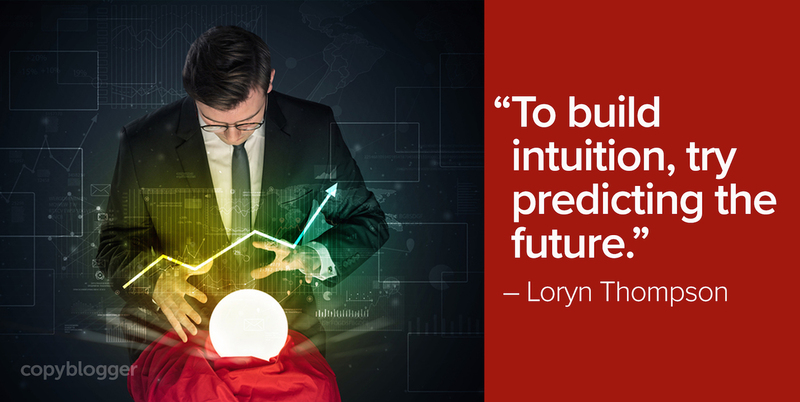 To build your intuition, you have to try to predict the future, not explain the past. Before you publish your content, take a minute to think about what you expect to happen. Do you expect this post to do well on social media, or build SEO traffic over time? Do you think you’ll get a better click-through rate on your email than usual? Do you expect people who read the post to opt in for your free PDF? When building your hypothesis, be specific. Choose a metric and try to guess what it will be. Don’t be shy — write down an actual number. Then, take a deep breath and post. Give it some time, then check back in. Did you get the results you expected? If so, awesome! You were right. Now see if you can do it again. If not, why do you think that was? Develop a new hypothesis, and write your next post to test it. Excellent. Thanks for the inspiration. I just wanted to say, that this blog completely inspired my marketing team and myself. We are using this as the basis to actively change the way we look at and use data. We are even changing the topics in our meeting agendas to pay more attention to the data we collect and use it to move forward. Great article!